Ref. 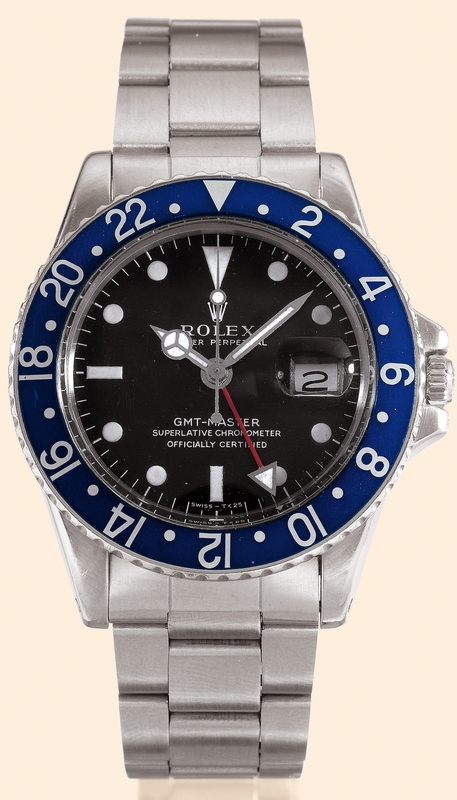 1675, Stainless Steel ?GMT-Master Blue Bezel" Rolex, Oyster Perpetual, "GMT-Master", Superlative Chronometer, Officially Certified, Ref. 1675. Made in 1970. Fine, two-time zone, center-seconds, selfwinding, water-resistant, stainless steel gentleman's wristwatch with date, blue 24-hour bezel and hand, and a stainless steel Rolex Oyster bracelet. Accompanied by a fitted box. C. Three-body, polished and brushed, screwed-down case back and crown, graduated bi-directional revolving blue 24-hour bezel for the second time zone, crystal with "cyclops" lens. D. Black with luminous round, triangular and bâton indexes, outer minute track, aperture for the date. Luminous "skeleton" hands. For a note on Ref. 1675, see lots 250 and 251 of the Mondani Rolex sale.